Every year around Easter, summer and Christmas my inbox explodes with questions from people who found my blog and want to know more about things to do and see in London, which always surprises me as the internet is so full of recommendations, but I’m happy to share the most frequently asked ones. The best neighbourhood to stay? The closer to Central London the more expensive it gets, but the further out the more you’ll pay for travel. If it’s a short trip and you don’t want to travel too much then consider paying more for a hotel. I would say zone 2/3 to save money on travelcards and travel time. For Air BnB look at areas closer to the famous one. Camden too expensive? Try Kentish Town! Shoreditch too steep? Look at Bethnal Green instead. 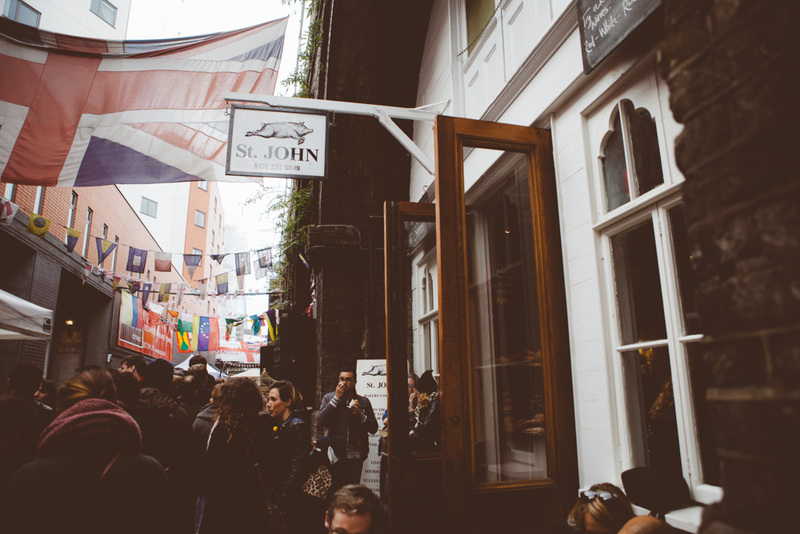 Hostels can be found everywhere but some of my faves are The Clink (my very London Hostel), the Generator and St Christopper’s Inn. What dessert or sweet treat would you recommend for someone visiting London for the first time and where? Afternoon tea perhaps? Sketch is worthwhile, but I can imagine that’s not in everyone’s budget so you could check GroupOn for cheaper options. Marks & Spencers also offer afternoon tea at its big branches. My go-to treat is a Signature Slice from Timberyard, with GAIL’s carrot cake a close second, and pretty much any ice-cream from Chin Chin Labs. What’s the best time of the year to visit the city? I notice more tourists in the summer and around Christmas and that’s probably for a reason. And who am I to say anything else? What are your recommendations of things to do in the London in the evening? For me personally it’s watching whatever show I’m binging at the moment, but I imaginee that’s not what you’re in London for. But I love doing the walk from the London Eye to Tower Bridge as you get to see the famous sights in a different light. 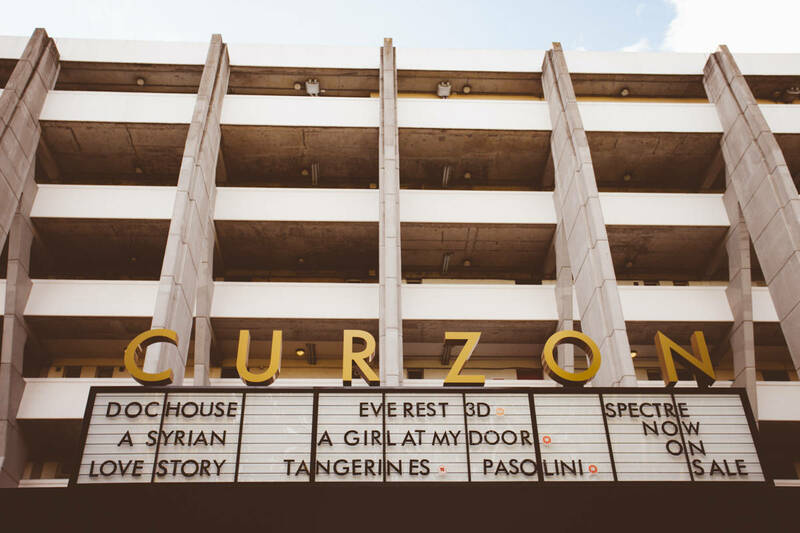 You can go see a movie, try your luck at a music venue, hope there’s a late night museum event on, chow down at a night street food market, check if there is a (pub) quiz anywhere around you or just go for a pint. What top London attractions are worth paying for? For me personally it was worth it paying to see a play Shakespeare’s Globe and visiting View From The Shard. The London Eye...not so much. You can get away with doing London on the cheap by sticking to the museums. If I was visiting London for a weekend and wanted to have one brunch at the best most typical place, what do you recommend? Hmm typical? How about traditional. A Sunday roast at a local pub? A Sunday Roast consists of meat, roast potatoes, gravy, roast vegetables and the delight known as Yorkshire Pudding (hint: it’s not pastry). I also think the brunch menu at Aster (Victoria) and German Gymnasium (King’s Cross) are great value for the money. They are more likely to have a queue so keep that in mind when planning your day. What the best food street market to visit? I don’t know about the best, but my all time favourites are Maltby Street and Broadway Market as they are always fun and vibrant without getting too crowded. Where would I find some great vintage shops? I loved the East End Thrift Shop and all of my best buys came from that place, but they recently closed and sometimes have a pop up show. Beyond Retro in both Camden and Brick Lane and Rokit in Covent Garden have relatively ok priced vintage clothes. Where can we find awesome vegetarian food in London? I’m not a vegetarian, more a flexitarian so I don’t really hunt these down. The few veggie places I’ve been didn’t leave a big impression and often felt like they only had one seasoning in their spice rack. Most places in London have a vegetarian option which has never let me or my taste buds down. However I have it on good advice from a v. friend that long-running organic vegetarian diner Mildreds in Soho, The Gate chain and serve-yourself salad spot Tibits off Regent Street are all worth popping into. 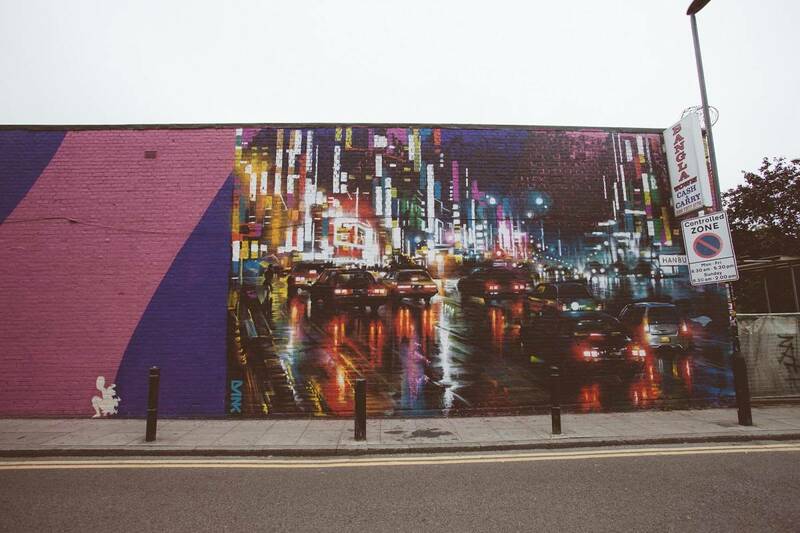 Where can I find the best street art in London? The most obvious one is in and around Brick Lane and Shoreditch where you’ll find all the spots that you’ve seen on Instagram. You’ll find the famous David Bowie just across from Brixton Station and I’ve also encountered nice examples while walking around in Camden, Kentish Town and Hackney. What is the most important thing I need to know about London for a first time visit? Stand on the right when on an escalator – especially during rush hour – and always ALWAYS! let people out of the tube carriage before going in. Also please don’t be so loud. If you could eat at any one place in London for dinner, without regards to worry about price or reservations, where are you going? Probably Duck & Waffle as it’s such a hassle to get to and if I could revisit one for the over the top experience it would be L’Atelier Robuchon. 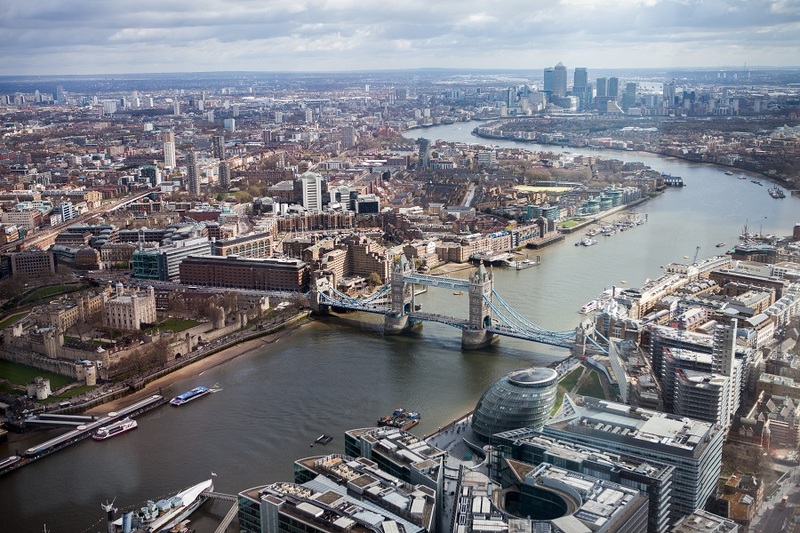 Which is your favourite location in London from where you can see the entire city? Would you rate any of it better than London Eye? When I lived in Kentish Town I loved walking to Hampstead Heath – it’s a green oasis and perfect to get away from the crowded city life and enjoy the view. But I imagine you might be looking for something more central, so why not go for the 360 degree panorama view from The Switch House at Tate Modern (free) or Sky Garden (also free, if you manage to get a reservation) or if you have budget, St. Paul’s Cathedral or View From The Shard are worth it too. I’m not a big fan of the London Eye and one of the most read posts on here here is actually the post on why I don’t like it. It might a fun experience, but don’t do it for the view. Where would you say is the best breakfast place in London? In Central London I like the Black Penny in Covent Garden/Holborn, followed by the nearby NY/Parisian style Balthazar. And if you are going South then Duck Egg Cafe at the Prince of Wales in Brixton or the pancakes at Three Eight Four. I always see a queue outside the Breakfast Club venues, but I’m not too much of a fan and prefer the Diner when it comes to chain breakfast options. What are some of the non-touristy and less explored places to check out in London? 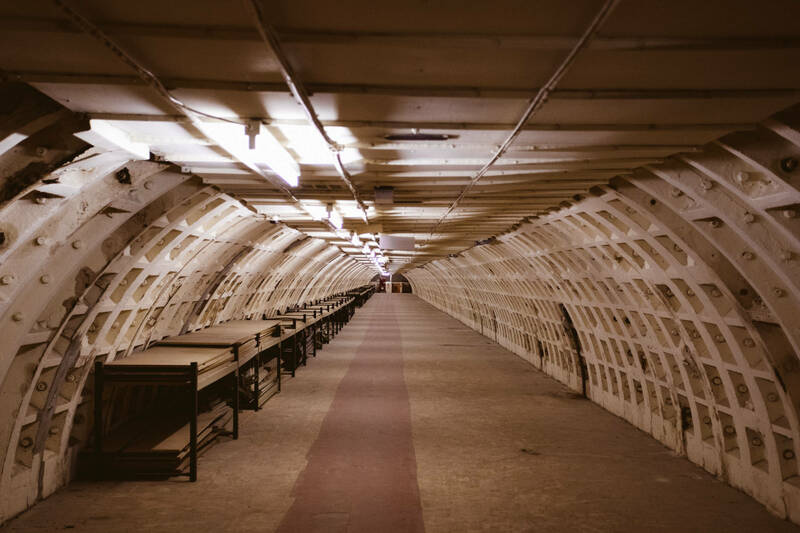 It needs some planning ahead of time, but the Hidden Underground Tours are great. If you have the time go and explore the dinosaurs at Crystal Palace park or one of these alternative things to do in London. What’s your favourite day trip from London? I’m going to mention the obvious ones first – as they are popular for a reason: Brighton for the hippy seaside vibe, Oxford for discovering the places that influenced your favourite books, and the charmingly traditional and quaint Leigh On Sea. Did I miss anything? Ask away!